Gone are the days when weddings used to be an entire family affair and right from the colour of the dress worn by the bride and the groom to fixing the menu, everything was controlled by the elderly members of the family. The time has changed and the weddings have turned more personal and it is also influencing the world of photography. 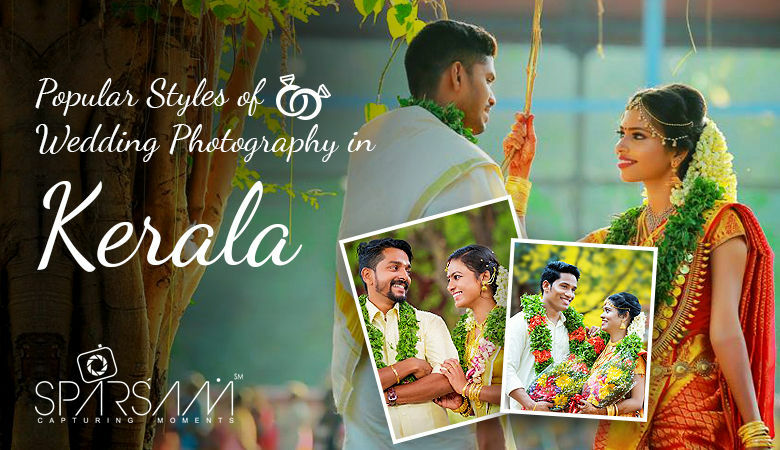 The bride and the groom are themselves selecting the styles of wedding photography in Kerala. Earlier, the weddings in Kerala used to be simple and austere. Things have changed now. Keralite weddings are turning nothing short of big fat Indian wedding ceremonies. Separate ceremonies for engagement and wedding are held and both call for a dedicated effort put forward by the best photographers operating in the adjoining areas. Pre-wedding photography is rising in popularity. Overall, the domain is expanding and lots of lucrative opportunities are beckoning young photographers. If you are thinking what is in a style, well, seemingly a lot. The style you choose for clicking your wedding photographs tells a lot about your personality and liking. You could discuss the intricacies of wedding photography styles with the best photographers in Thrissur. They are masters of the subject and hence are better positioned for explaining you all. By the way, if you want to expand the range of photography, better to choose a film. You get to play with the shadows as well as highlights. What more, the images get a soft and organic tinge to them. One thing to be remembered if you choose this medium, you should be patient as it needs time for processing and editing. Be ready to pay more as the cost would escalate with more hard work put through by the photographers. Whenever I open up the album of my parent’s wedding, I watch in awe. If this has been the case with you, the classic photos are just what you need. Few could replace them as they have stood the test of time. The only negative thing might be the excessive formality of the setup (then it all depends on your personal taste). Classic wedding photography in Kerala has uplifted the veil of documentary photos and decorated it with artistic tinge. Probably the best definition of lifestyle photography will be redefined photojournalism. This is a perfect balance between candid photography with a certain degree of direction and styling. The feel emanated is relaxed and approachable. The best photographers in Thrissur will set the scene while waiting for the ideal moment to click the shutter. None but only the best shutterbugs could master the art of dramatic photography. The right degree of light is a key component of such photographs and many photographers spend years before gaining expertise in off-camera flash photography. There is no need to stress yourself with the nitty-gritty of wedding photography styles. The thing you need is to discuss with a proficient photographer and view some samples. Check with your known people about the reputation of the photographer and appoint his/her services. We wish you a grand success in all your endeavours.